Coahoma County has fifteen markers on the Mississippi Blues Trail listed below with a downloadable map. For more information on the entire Ms Blues Trail and specific marker locations visit www.msbluestrail.org. 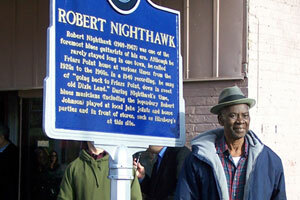 Robert Nighthawk (1909-1967) was one of the foremost blues guitarists of his era. Although he rarely stayed long in one town, he called Friars Point home at various times from the 1920s to the 1960s. The Lula area has been home to legendary Mississippi blues performers Charley Patton, Son House, Frank Frost, and Sam Carr. Patton immortalized Lula in the lyrics of his recordings “Dry Well Blues” (1930) and “Stone Pony Blues” (1934). His wife Bertha Lee also sang of “livin’ at Lula town” in her 1934 record, “Mind Reader Blues.” Frost lived in Lula in the 1960s and ’70s and performed with Carr and Big Jack Johnson in the Delta’s most renowned juke joint band, the Jelly Roll Kings. Muddy Waters’s first recordings were made on this site on the Stovall Plantation. The Delta Blues Museum, the world’s first museum devoted to blues, was founded on January 31, 1979, by Sid Graves, director of Clarksdale’s Carnegie Public Library. Originally housed in a room of the Myrtle Hall Elementary School, the museum moved to the library in 1981 and to this location, a former railroad depot, in 1999. Exhibits here have paid long overdue tribute to the history of the blues, while the museum’s education program has trained many young musicians to carry the blues into the future. The Sunflower River Blues and Gospel Festival, a preeminent showcase for homegrown Mississippi talent, began in 1988 as a promotion to draw area shoppers to downtown Clarksdale. The festival’s dedication to presenting authentic blues soon made it a renowned attraction for blues enthusiasts from around the world, as local favorites began sharing the stage with an international cast of guest stars. One of Clarksdale’s most talented and renowned blues musicians, Wade Walton (1923-2000) chose to pursue a career as a barber rather than as a professional enter-tainer. Walton never lost his love for blues, however, and often performed for customers and tourists at his barbershops, including the one he operated at this site from 1990 to 1999. Walton, a popular and respected local figure and a charter member of the city’s NAACP chapter, was inducted into the Clarksdale Hall of Fame in 1989. Rock ‘n’ roll and rhythm & blues pioneer Ike Turner began his career playing blues and boogie woogie piano in Clarksdale. Turner was born less than a mile southwest of this site, at 304 Washington Avenue in the Riverton neighborhood, on November 5, 1931. In his pre-teen years he got a job here at the Hotel Alcazar, where he operated the elevator and did janitorial work. Turner later rose to fame as a deejay, producer, and leader of the Kings of Rhythm band and the Ike & Tina Turner Revue. The golden voice of Sam Cooke thrilled and enchanted millions of listeners on the hit recordings “You Send Me,” “Shake,” “A Change is Gonna Come,” “Chain Gang,” and many more. Cooke’s captivating blend of gospel, blues, pop, and rhythm & blues made him a pioneer of the genre that became known as soul music in the 1960s. Cooke was born in Clarksdale on January 22, 1931. His family resided at 2303 7th Street until they moved to Chicago in 1933. This neighborhood, known since the turn of the twentieth century as the New World, was a breeding ground for ragtime, blues, and jazz music in Clarksdale’s early days as a prosperous and adventurous new cotton town, when brothels here attracted both white and black clientele. Jews, Italians, Chinese, Syrians, and Greeks owned various local businesses, as did some African Americans who lived here, including the Messenger family, which opened its first business on this block in the early 1900s. Since 1944 the Riverside Hotel has provided lodging for several bluesmen including Sonny Boy Williamson II, Ike Turner, and Robert Nighthawk. Prior to that, it served African-Americans of the Delta as the G.T. Thomas Hospital where the Empress of the Blues, Bessie Smith, died in 1937 from injuries sustained in a car accident. Smith was traveling to Clarksdale for a performance when the accident occurred. In 1944 the Hopson Planting Company produced the first crop of cotton to be entirely planted, harvested, and baled by machine. Blues pianist Joe Willie “Pinetop” Perkins was a tractor driver there at the time. Dunn Mound. The Mississippi Mound Trail project is a self-guided driving tour located along or near Highway 61 in the Mississippi Delta. The trail route parallels the Mississippi River. The purpose is to raise awareness and enhance protection of the vast array of pre-contact (prehistoric) Indian mounds and earthworks in Mississippi. The Mississippi Mound Trail has 33 historical markers and opened in 2016. Dunn Mounds is located in Lyon (near Clarksdale) on Highway 6 near Crum Road.